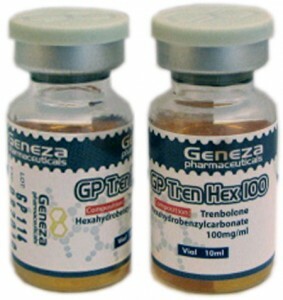 GP Tren Hex 100 by Geneza Pharmaceuticals is an injectable steroid containing 100mgs per 1ml of the Trenbolone Hexahydrobenzylcarbonate. GP Tren Hex 100 (Trenbolone Hexahydrobenzylcarbonate) – will give you well-maintainable and quality gains. GP Tren Hex 100 – provides good results in achieving mass when stacked with Testosterone and/or Methandrostenolone. GP Tren Hex 100 – does not cause any water retention normally.